My sons, 9 and 8 years old, now are in 3rd and 2nd grade. I still remember how they went to kindergarten which they never liked. The mornings were hectic because I needed to gently persuade them to go to school. I was worried this condition would continue until they entered elementary school. But, alhamdulillah, it didn't happen. Both my sons go to school everyday in high spirit. They go to Islamic Full Day School which runs from 7.10 a.m to 1.45 p.m. They do noon prayer at school, even my first son does dhuha prayer and Jumah prayer at school as well. Being in an Islamic school means they get quite enough opportunity to learn the deen from their early age. It includes Quran recitation and memorization. My first son almost finishes his memorization of Juz Amma (Juz 30) now. After that he will be tested to be certified. My second son, Mr. Professor, completed his Quran reading learning and being certified to read the Quran now. He started from Juz 27, surah Adz Dzariyat. Masha Allah, I'm very proud of them. I'm dreaming to have sons who love the deen very much. I really wish they love reciting and memorizing Quran and love to attend prayers at masjid. It seems that having Islamic environment really help my sons a lot to reach such achievements that I didn't at their age. Different era, different condition, right? How about everyday ibadah other than prayers and reciting Quran? There are many things I need to teach them. For instance what to do when entering the house, how to eat the Islamic way, what to do before sleeping at night, etc. Sometimes I tell them stories to remind them how important to follow the Prophet's way. 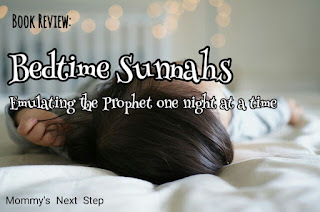 Talking about what to do before going to bed at night, book publisher, Prolance, has released a book called Bedtime Sunnahs: Emulating the Prophet one night at a time. 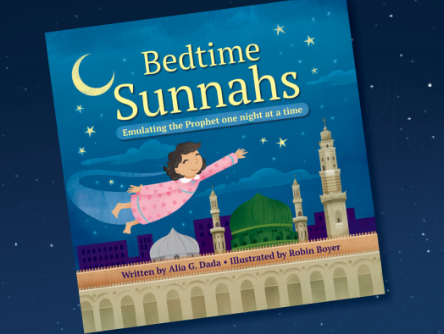 This rhyming book outlines several nighttime Islamic practices for kids - and even adults - to implement before going to bed. Fostering a love for the Prophet’s Sunnah, as well as teaching children to practice good deeds consistently. I think it's a brilliant way to let my sons read this large, colorful, hardback, 26-page book. Beautifully illustrated by Robin Boyer, makes it more vibrant. This book also includes references to associated hadiths, an explanation of Islamic terminology, and additional advanced practices, for ones who need to know. The Author, Alia G. Dada who was born and raised in Southern California, graduated from Cal Poly Pomona with a Bachelors Degree in Business Administration and a Minor in the Spanish Language. Shortly after, she moved to Cairo, Egypt. After privately studying Arabic she went on to obtain her degree in Islamic Law (Shariah) from the Al-Azhar University. Blessed with a child who has a love for reading, she was inspired to write a book that would help caregivers water the seed of faith and Islamic literacy in the hearts of young Muslims. Hands up, hands up, we must make dua before we close our eyes. Let's raise our hands up towards the skies. MashaAllah ...loved your post...I'm from Pakistan and really appreciate the way you are nurturing your kids. My daughter is 9 also MashaAllah and just finished reading Quran for second time. She is memorizing Surah Yaseen these days MashaAllah. Looking forward to reading more of you! Thank you for stopping by. Masha Allah, great effort for a little girl to finish the reading twice!